Microsoft has announced the wireless Surface Dial for its tablet and computer line, but a third-party option bringing much of the functionality of it to the Mac has existed for some time —the Griffin PowerMate. The original Griffin PowerMate was USB powered and connected, and launched back in the tail-end of the MacOS 9 days in early 2002. Two versions exist now, with the PowerMate USB and PowerMate with Bluetooth connectivity versions being sold in parallel. Both are customizable jog/shuttle wheels, allowing users to configure application-specific controls by keystroke or command in the companion app. The truly devout can connect up to 127 of the PowerMate USB model to one computer, with each having a custom function. 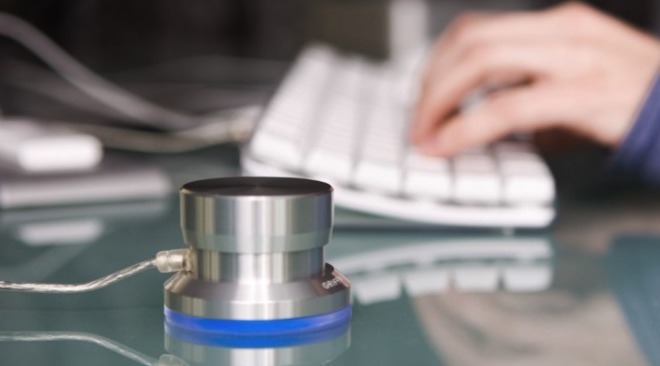 The PowerMate has been used by Photoshop users for a long time, and sees heavy use in audio and video editing as the bespoke jog wheel to quickly scrub through a selection. The "ground effect" light at the base of the USB model can be used for rudimentary user notifications as well, and can also be customized by the user. No, the PowerMate won't do some of the things that the new Surface Dial will. It won't be detected automatically when placed on your Mac's screen, and pop up a color wheel like Microsoft promises that its wheel will, but it is also cheaper, and compatible with a wider range of computers, both old and new. A version of the PowerMate software for the $40 USB version requires a PowerPC and OS X 10.3.9 or newer, with the best version of the driver and companion app compatible with Intel processors, and OS X 10.6 or newer. The $60 Bluetooth version has slightly stiffer hardware requirements, but if you own a Mac made since 2011, you're probably fine. On the other side of the fence, Windows XP and Windows Vista users have available and reliable software as well. Windows 7,8, and 10 users have an installation path, but report quirks and crashes.